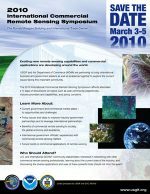 The Office of Space Commerce promotes U.S. commercial remote sensing satellite services by contributing to the development of government policies affecting the industry, voicing the industry’s interests within interagency policy discussions, and representing U.S. commercial interests in international negotiations. In January 2013, the major two U.S. commercial remote sensing satellite firms, DigitalGlobe and GeoEye, completed their merger, retaining the DigitalGlobe name. On August 6, the National Geospatial-Intelligence Agency awarded $7.3 billion in contracts to two U.S. commercial remote sensing firms in support of the EnhancedView program.